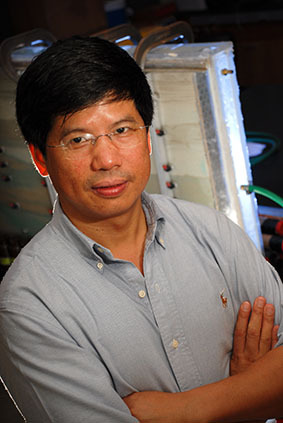 From the August 2013 Desktop News | Dr. Chunmiao Zheng, the George Lindahl III Endowed Professor in the Department of Geological Sciences, has been named the 2013 recipient of the O.E. Meinzer Awardby the Geological Society of America. The O. E. Meinzer award is given annually to the author of a published paper of distinction that has advanced the science of hydrogeology. The O. E. Meinzer award has been considered the highest distinction for hydrogeologists internationally since its inception in 1965. Zheng was also awarded the M. King Hubbert Award from the National Ground Water Association, which honors the scientist who has made a major contribution to the groundwater industry through research, publications, teaching, or practical applications. These two awards are the latest in a long list of honors for Zheng, which include the National Ground Water Association’s John Hem Excellence in Science and Engineering Award. He is also a Geological Sciences of America Fellow and was named the Birdsall-Dreiss Distinguished Lecturer by the GSA’s hydrogeology division. Zheng is the author of numerous heavily cited papers, books and transport models that represent many areas of the hydrogeology field, including aquifer remediation design, contaminant degradation process simulation, monitoring network design, single- and multi-rate mass transfer and groundwater-surface water interactions. His books on applied contaminant transport modeling, co-written with Gordon Bennett, are used in classes throughout the world and as reference books. One of Zheng’s most prolific practical contributions to the field of hydrogeology is the versatile MT3D solute transport code, which is among the most widely used transport models. Since he created it, he has extended the capabilities of MT3D to simulate reactive multispecies transport and that model — MT3DMS — has become increasingly popular as well. He regularly teaches short courses throughout the world on the foundations and use of MT3DMS and MT3D. Zheng earned his bachelor’s degree in geology from the Chengdu Institute of Geology in China and his doctorate in hydrogeology with a minor in civil and environmental engineering from the University of Wisconsin-Madison. Zheng has been on the College’s faculty since 1993 and also holds a professorship at Peking University in Beijing, China, where he is the founding director of the Center for Water Research.